You can tell from the image above that I did this series in two stages. The first day I did the circle, and the next day I walked up and did the arrow portion. On Day-1, I parked off the east side of I-95 on Moccasin Rd, just across from the Kyle Canyon exit. There was a dead-end road sign that you can drive around but driving is NOT permitted in the desert so don’t do it… just park at the road closed sign and walk in. It was just a couple of tenths to the first cache and the series. 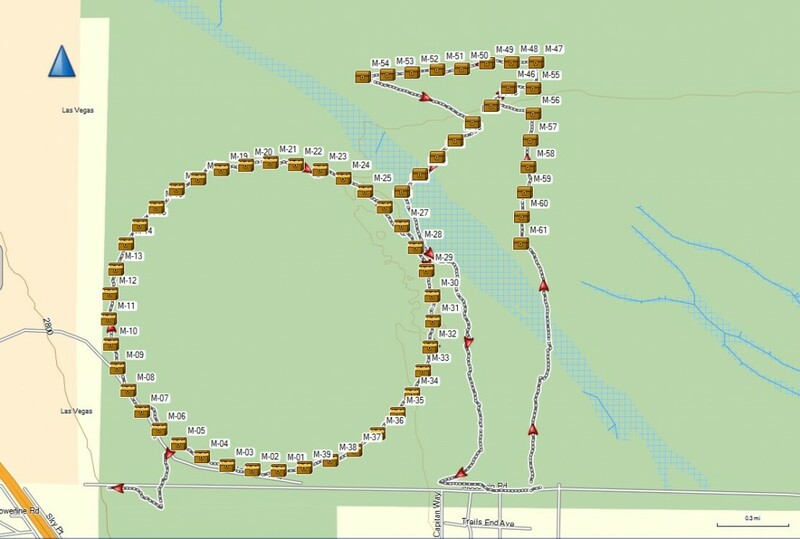 The circle was a hair over 5.5 miles and I took just under 3 hours to complete it. The walk was easy, the ground was pretty firm with very little sand and only a couple of small gulleys, and one or two small hills to walk up. On a difficulty scale of 1-5, this was a 2 or 2.5. Day-2 I parked at the end of Decatur and walked the 1.2 miles up to the start of the arrow. I went along the outside of the arrow and then walked over to do the shaft, and then back to my truck from there. All told this was 6 hours and as I was hurrying, it also took under 3 hours. The walk this day was more difficult than the first with more gullies to cross, less even ground, and some old mud flows to cross and climb over. They were dry now, but it made for more difficult walking. On a scale of 1-5, this walk was a 3 for difficulty. Again, from the area I parked there are entrances into the area but again, driving is NOT permitted so don’t do it. Finally, P-WSO did this all in one day and parked near the end of Durango there, and called it 10.1 miles for the whole loop!